Domestic tourism consumption experienced robust growth during this Spring Festival holiday. Scenic spots across the country received 386 billion visitors, bringing in revenue totaling 475 million yuan, an increase of 12 percent. Consumption continues to grow. Tourism has brought huge commercial opportunities and a promising market for urban development while keeping pace with people’s growing demand for a better life. Xu Fengzeng, a professor from the School of Management at Shandong University, said developing tourism further improves the functions of cities and their soft power. Tourism plays a key role in the aspects of construction of infrastructure, dissemination of cities, systems of road signs, planning and construction of landscaping as well as the cultural interaction between tourists and citizens. At the same time, attention should be paid to the relationship between urban development and preserving traditions to prevent harm to the culture, architecture and image of cities caused by the unchecked pursuit of economic benefits. In recent years, tourism has become one of the fastest-growing sectors, improving the scale and quality of the service industry as a whole. It serves as a new engine of China’s economic and social development. Ma Xiaolong, a professor from the College of Tourism and Service Management at Nankai University, identified five tendencies of domestic tourism. There has been double-digit growth in overall tourism demand annually, with people traveling for increasingly diverse reasons, such as sightseeing, holiday shopping or leisure. Also, people are seeking higher-quality tourism products, and in the future, more Chinese families will travel on their own instead of with tourist groups. In addition, the environment for the tourism industry is increasingly favorable as governments are paying unprecedented attention to the field with a series of policies to encourage its development, Ma said. The tourism sector is showing a greater ability to combine such various elements of traditional tourism as dining, accommodation, sightseeing as well as shopping and entertainment. Also, tourism is increasingly integrating with industry, agriculture and other forms of the tertiary sectors, Xu suggested. It is important to keep up with the era of Internet Plus in order to make full use of our advantages in terms of scale and application of the internet, thus achieving greater ability to innovate tourism. The internet has shifted the commercial pattern of traditional travel agencies and its impacts will further expand to various domains such as accommodation, transportation as well as scenic spots. The various applications of smart technology have laid foundation for developing tourism. Internet-oriented thinking and the integration of different sectors will further boost the capability to innovate tourism, Xu said. The model of internet plus tourism can be innovated from two aspects. Li Junyi, a professor from the School of Geography and Tourism at Shaanxi Normal University, said it is crucial to provide tourists with instant information which requires combining internet, data searching and artificial intelligence. 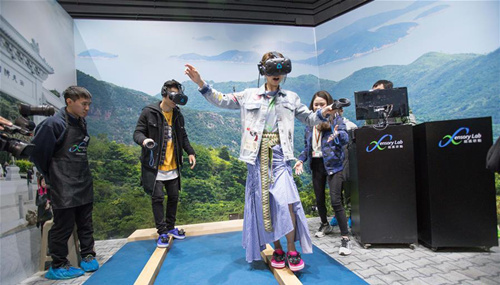 Also, tourists’ demand for better experiences can be satisfied by the constant development of new tourism projects with virtual reality and other technologies. Companies can sell their products on the internet and seek online commercial opportunities. It is also necessary for companies to apply internet and information technology to innovating their commercial patterns.